I thought I would break down and cry when my little boy, who hasn’t left my side for more 24 hours in his whole life, would leave me for almost two weeks! I was all teary-eyed at the airport. But I wasn’t bawling my eyes out. I guess deep down I am independent of him! Haha. 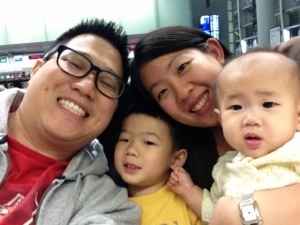 Saying our farewells at the airport. 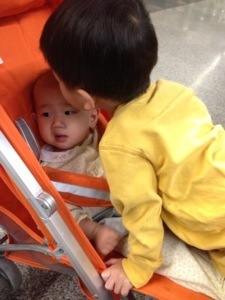 Eric said EJ did a good job telling daddy he needed to potty while they were on the plane. One of the things we were worried about was regression from potty training. We did have a couple of accidents since then. But can you blame the boy? 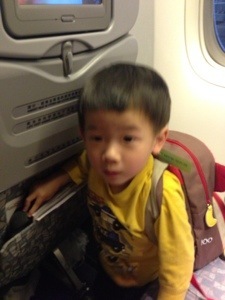 He’s so tired from being jet-lagged that he can’t control it!! Not looking forward to that when they come back. 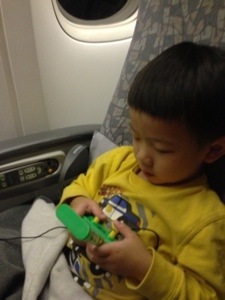 EJ, quite the seasoned traveler. Flying since he was two months old! 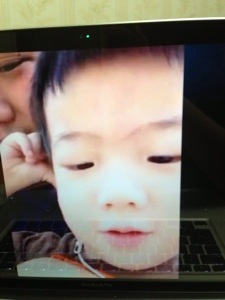 Whenever we get the chance, we Skype. Elsa gets really excited to see her brother. She starts climbing onto the table towards the laptop and just squealing in delight when she sees EJ. She loves her big brother! 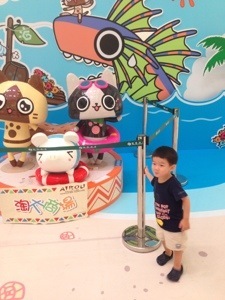 Eric’s family in Hong Kong are enjoying their visit as well. 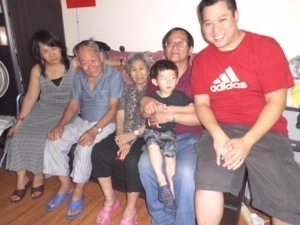 EJ gets to see his grandpa (visiting from Australia) and great-grandparents (lives in Hong Kong) and great aunt (visiting from the UK). 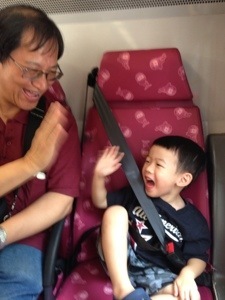 And of course, Eric and EJ are enjoying being a tourist in Hong Kong! 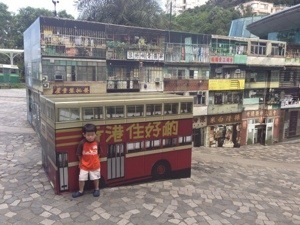 Even though Eric speaks pretty fluent Cantonese, locals can still tell that he’s a foreigner (in his own motherland, lol) because of the way they dress! 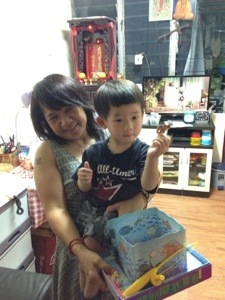 And of course, EJ doesn’t speak a lick of Cantonese. 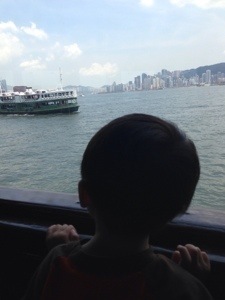 Riding the ferry across the Hong Kong bay, overlooking Hong Kong’s city skyline. 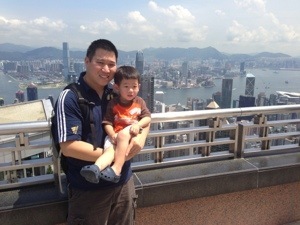 On top of Victoria Peak overlooking the city. 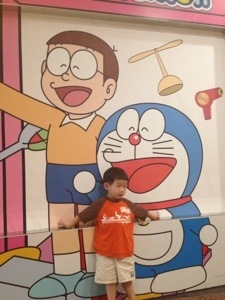 With Eric’s favorite childhood/adulthood cartoon character, Doraemon. 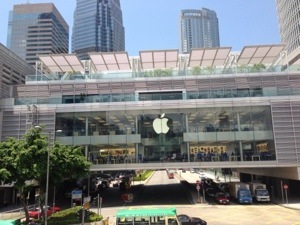 A huge 4-storey Apple store next to the train station. Macaroni noodle soup at MacDonalds. Yum!